Fishing off the coast of Washington is outstanding during the summer months - charters will be waiting at Ilwaco, Westport, La Push, Sekiu, and Clallam Bay. Whether it's steelhead or fly fishing, Washington's rivers and lakes will offer a thrill and a challenge for the serious angler. The small pristine lakes of the Okanogan Highlands are especially rich in trout. Washington State Dept. of Fish & Wildlife. Olympic Peninsula Oct. thru Apr. We Specialize in Guided Spin, Drift and Fly-Fishing Trips for Steelhead, Salmon and Trout on Washington States Premiere Cascade, Coastal and Yakima Rivers. RELAX and Enjoy a Day on the River. Let Our EXPERIENCE and KNOWLEDGE Guide You to the BIGGEST FISH! 407 Knudson Cove Drive N.
Experience the great Alaska Salmon and Halibut fishing of the Icy Straits while enjoying all the comforts you've become accustomed to back home. Turn your next ordinary fishing trip into an extraordinary action packed adventure by booking your next fishing expedition to spectacular Gustavus, Alaska with Angler Adventures. Want to wrestle some lingcod or snapper from the icy depths? 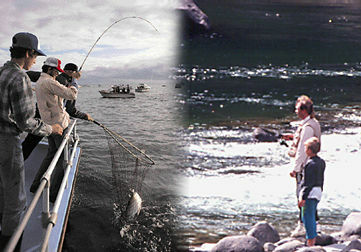 Alaska's best sport fishing is just a 45 minute boat ride from Gustavus, with convenient access from Juneau, Alaska. Rise to the challenge of catching the ultimate king salmon, wild coho, or giant halibut as you thrill to magnificent scenery, wildlife and awesome whale watching.